Around the world, more than 275 million people speak French. Want to join them before your next trip to a French-speaking country? We can help. Figuring out how to learn French on your own might sound difficult, but it is possible to teach yourself French. You just need a few tips and strategies to help you get started. Once you start learning, the successes of building your vocabulary and knowledge will motivate you to keep going. Not sure what it takes to learn French? Keep reading to discover the best way to learn French on your own! Every learner is different, and there’s no one-size-fits-all approach. To get the most out of learning French on your own, you need to first know what kind of learner you are. You might be a tactile or kinesthetic learner, who needs to learn by activity. These kinds of learners don’t benefit from sitting still in a classroom environment. You’ll need to incorporate movement and action into your study sessions. Auditory learners do best when they learn by hearing. If this is your learning style, you might want to spend a lot of time with audio lessons and books on tape in French. Other learners do best with reading and writing. You might read French books and write down vocabulary and sentences in your notebook to maximize your learning. Finally, some people are visual learners. You’ll do well with image-based learning. For example, you could look at a map and try to add the French names for things you recognize to it. It’s also important to incorporate different learning methods into your studies, no matter your learning style. But if you focus on the methods that cater to your learning style, you’ll move forward faster. Learning random vocabulary words, and putting them together into random sentences, won’t keep you motivated to learn. Instead of trying to learn everything systematically, start by learning the words and phrases that you can really use in practice. This will help you feel like you’re making progress, and keep you from feeling overwhelmed. You can learn common greetings, how to ask for your favorite foods and drinks, and how to ask for directions, for example. Start simple, and then work your way up to saying more complex things. Learning French on your own means you might not have classmates or peers to practice with. However, you can talk to yourself in French and get the same benefits. It might make you feel strange at first, but you’ll soon get used to chatting with yourself in French. Work on saying things out loud — it can just be whatever you’re doing, or what’s on your mind at the moment. This will help you learn to form sentences without the added pressure of having another person there. The most common technological tools, like your smartphone’s GPS, can help you in your journey to learn French. For example, you can set your GPS navigation to French, which will help you quickly learn common directional terms. You can gradually start switching more of your apps to French as you get comfortable with the language. Eventually, you can even set a news app to French news. 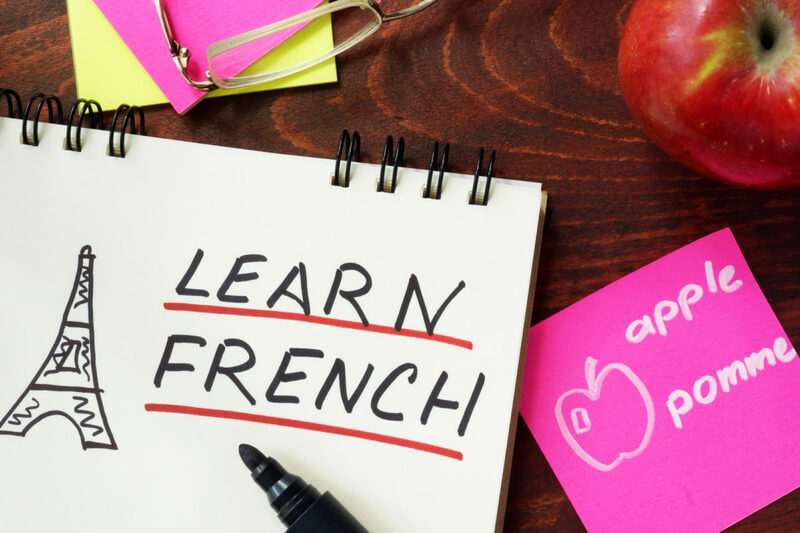 That way, you’ll not only practice the language more, but you’ll also start learning about which current events the French-speaking world is discussing. Rather than studying in big, exhausting blocks, set a goal of studying French for a short amount of time each day at a minimum. You can start with just 10 or 15 minutes a day and still get results. As you see yourself progress, you might find yourself choosing to study more. But as long as you meet your minimum, you can count that day as a success. With this daily-time approach, consistency is key. If you miss a day, doing double time on the next day won’t be as beneficial as if you’d studied each day. You’ll lose new information quickly if you aren’t refreshing it with short, daily sessions. Make it a routine: you could try studying at the same time each day, for example. Pick a time when you won’t be distracted or too tired to focus. It’s impossible to separate language and culture. While learning French, learn as much as you can about the culture of France, or whichever French-speaking country you plan to visit. Learning the culture will also make learning the language more fun! Watch French shows, read French poems, and listen to French music. Learn about the history of the French-speaking world. When you encounter a French word, your first instinct might be to think of the English translation for that word. But you’ll streamline your learning process if you simply think of the item or concept itself, not its translation. You can also use flash cards to accomplish this. Instead of writing an English word on the other side of the flash card, draw an image of the French word. The drawing doesn’t have to be good: it just has to make you think of what the word means. Repetition is essential for learning any new language. Don’t worry about learning new words every day. This can quickly overwhelm you. Instead, spend time reviewing often. For example, if you learned the French relative pronouns yesterday, you can spend your study time today repeating them. This will cement the new words in your mind, freeing up space to learn more when you’re ready. Keep in mind that the longer and more complex the word, the longer it will take you to memorize it. Some words will take more repetition than others. Now You Know How to Learn French on Your Own: Get Started Today! With this guide to how to learn French on your own, you can troubleshoot common problems and move forward faster. You’d be amazed at what just one small session a day can accomplish when you stick to these tips. Soon, you’ll be ready to carry on entire conversations in French. Ready to plan your trip to a French-speaking country? Check out our budget vacation planning tips here!